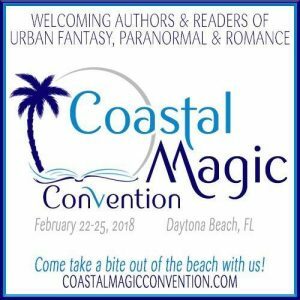 THIS THURSDAY kicks off the weekend we’ve been waiting for all winter long–Coastal Magic Con in Daytona Beach, FL! 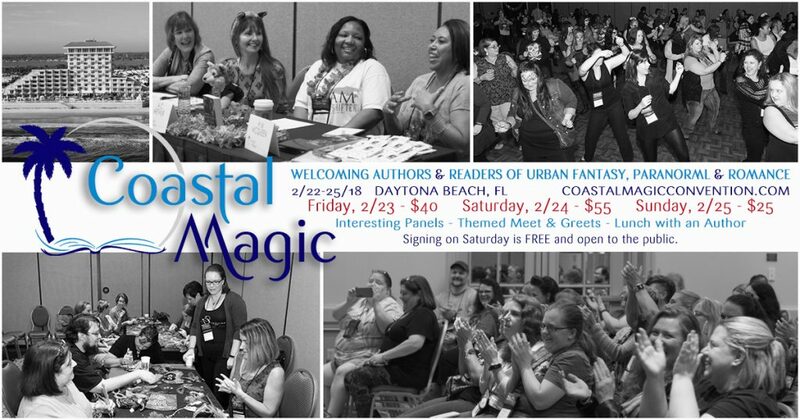 Dance parties, fun and games, and the opportunity to hang out with some of my closest writer friends ON THE BEACH! Here it is, folks! Technically, it’s still tentative, so be sure to double check these on the app and in the program booklet. Convention Dates are Fri(9/2/16), Sat(9/3/16), Sun(9/4/16), and Mon(9/5/16). I will be arriving on Wednesday with Bianca Roman-Stumpff so that I can help her set up in Pop Art Alley on Thursday. Bianca has kindly offered to squirrel some of my books away behind her table–so if I’m not on a panel and Pop Art Alley is open, that’s where I’ll be! Come find us! Description: From Twitter, to YouTube (booktube! ), Reddit, podcasting, Goodreads, PATREON – the online YA community is vibrant. Description: Join this motley band of talented (and costumed) authors for an entertaining hour of rants, rap battles, zombie haiku, musical numbers, and more. Swag for the first 40 audience members! Stay after the show for an autographing and meet & greet! Alethea and costumed members of her Brute Squad will be walking in the YA section this year — look for Alethea’s patchwork skirt and her trademark Blue Alphabet Umbrella! Description: Short stories: equal parts art, science, and kung-fu. How does writing a short story differ from writing a novel? Should every author write short fiction? Description: Many of the supernatural beings and magical creatures appearing in Urban Fantasy have their roots in myth and folklore. Our panelists discuss those they feel most influenced by and others they have discovered in their research. Description: Media tie-ins are very popular. Our panelists discuss how this works and their participation in a new superhero anthology. This is the only event on my schedule that MAY change, so keep an eye on my Twitter Feed for any last-minute changes. If you miss me, come see me at Bianca’s table in Pop Art Alley! The con is still two weeks out, so this is subject to change, but here’s what I’ve got right now. Also, not 100% sure I’m walking in the parade yet. Will update everyone when I know for sure. Description: Readings, music, & more from a motley band of costumed authors, plus swag! Description: Urban fantasy is rooted in age-old myth, legend, and folklore. Authors discuss influences. Description: The bestselling author of Darkhunter and Chronicles of Nick series answers your questions. Hey there, everybody! Are you ready for Dragon Con 2014? 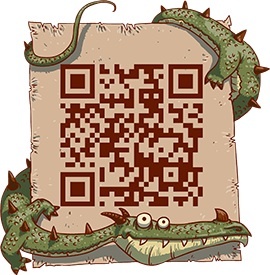 Here’s my schedule for the weekend (be sure to download the DC App — here’s the QR code for you!). You may notice my distinct lack of autographing times here…but DO NOT WORRY. 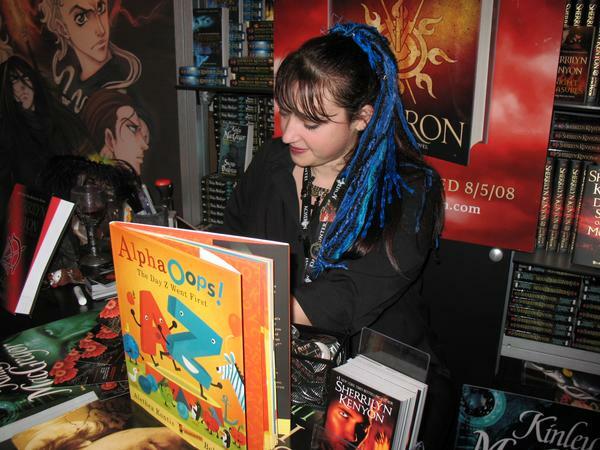 Sherrilyn Kenyon also does not have any officially scheduled autographings — that’s because we will both be signing books at her booth in the Exhibitor Hall at various times throughout the weekend. I will also be signing books at the TAIREN’S LAIR booth, and I hope to also have books with me at the SON OF NO ONE book launch on Thursday night. Description: A motley band of talented (and costumed) authors offers an entertaining hour of readings, musical numbers, and more. Description: Our panel of authors discusses how they employ folklore and/or mythology in their work. Description: Authors discuss why Young Adult Urban Fantasy can have just as much visceral and emotional impact as that written for adults. In an effort to get myself in order, here is my complete agenda (so far) for BEA week. Some things I will only be attending, not presenting (like the luncheon), but for everyone’s sanity (including mine), here is the full list of my scheduled commitments. The ones where I will be speaking/signing/freaking-out-about-winning-an-award will be in bold. Stopping square in the middle of the HERO novel edit to go to NY today. NY Comic Con, here I come! If you’ve downloaded the NYCC app (which is a smart thing to do), I’m not actually listed. BUT YOU ALL KNOW WHERE TO FIND ME: At Janet Lee’s table in Artist Alley! I will be there for the duration of the convention — that’s right: Thursday – Sunday. Please come by and see me! Janet and I will also be selling THE COMPLETE SET OF ALPHABET PRINTS from WONDERLAND ALPHABET, which has never before been available. And…as always…THERE WILL BE SWAG. 1.) When I am not programming (or shopping), I will be with Janet K. Lee at her table in Artists’s Alley. We will have lots of books and swag and Wonderland Alphabet prints and other goodies. Please come visit! 2.) 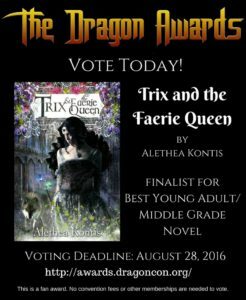 Once again, my reading hour will be Princess Alethea’s Traveling Sideshow! Readings, singing, dancing, Zombie Haiku…and free goodie bags for the first 48 people who show up. So, tell your friends…but make sure you get there first!! Description: Q&A with the bestselling author of the Dark-Hunter series. Description: How to break into one of the hottest markets out there. At long last I have it: My Mysticon 2012 schedule! Mysticon is a sci-fi, fantasy, & horror convention held February 24-26 at the Holiday Inn – Tanglewood (4468 Starkey Road, SW) in Roanoke, VA. Author Guest of Honor is the lovely Sherrilyn Kenyon, and Artist Guest of Honor is the fabulous Ursula Vernon! 2.) I will not be appearing on Sunday, because I need to head home first thing in the morning. I do hate leaving so early — especially on the rare occasion that I get to see Sherri! — but the 26th is both the Fairy GodBoyfriend’s and Fairy Goddaughter the Younger’s birthday. I CANNOT MISS THIS. I would lose all my Fairy Godmother points. It’s also the Fairy GodBoyfriend’s DOUGLAS ADAMS BIRTHDAY (42, of course), so missing that would throw the universe into some sort of improbability chaos…and we can’t have that, now, can we? Determined to vanquish evil in the night. Join Sherrilyn and our other panelists as they discuss how you too can be a dark hunter and protect humanity from things that go bump in the night. Why are vampires so popular? Is anything likely to rival them? Werewolves? Zombies? If so, what? Whose vampires are the best and why? Getting close to bedtime? Bring your pillow and curl up by the fireplace for tonight’s bedtime stories. You’ve probably heard of Lovecraft, Stoker, and Poe. Now learn about some of the other past masters of terror tales as panelists discuss favorite horror writers and their works. Because you might have missed it, here it is again. Write it down! 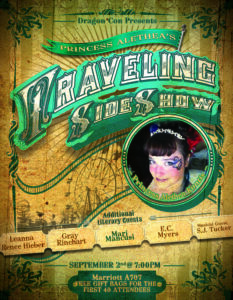 And be sure to attend PRINCESS ALETHEA’S TRAVELING SIDESHOW! Readings! Dancing! Singing! Puppets! Rubber duckies! Zombie Haiku! Free FABULOUS swag bags for the first 48 people! Fun for the whole family! You don’t want to miss it! Description: Fables and fairy tales in dark fantasy literature. When I am not at these locations (and not walking in the Parade – Sat, 10am), I will most likely be found at JANET LEE’s table in Artists Alley. I will do my absolute best to bring some books to sell…but airplane luggage charges being what they are, coupled with the fact that I sold out quickly last year, please remember that it is always best if you bring your own copies of books for me to sign. Now I’m going to check out some more Dragon*Con TV and make a grocery list. Granola bars, tea, beef jerky, baconnaise…CHECK. See you soon! 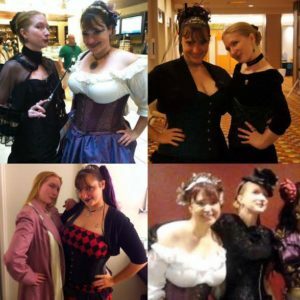 Because it’s never too early to start thinking about Dragon*Con! But you won’t have a chance to get it unless you come see me!